It's pretty surreal sitting down to write this post. 38 weeks... we made it to term! This will officially be the last pregnancy update I write. We will meet our son this week one way or the other, a fact that we are still wrapping our heads around. I am glad I have these weekly updates to look back on, and overall I am just feeling really grateful. It's been a healthy, mostly uneventful pregnancy, and I couldn't ask for more. 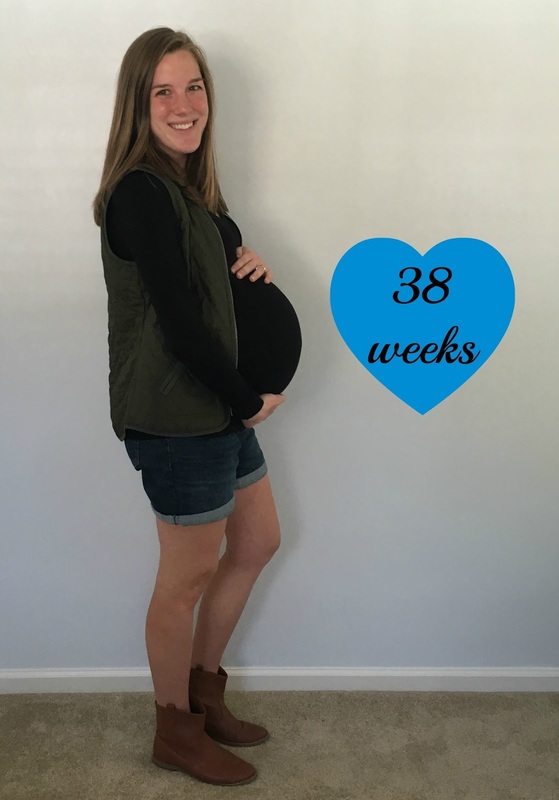 Here is what week 38 of pregnancy has looked like! I had my last doctor's appointment on Monday. We did one last non-stress test to check baby's reactivity since I have extra amniotic fluid, and he looked great as always! I've had to do those twice a week for the past month or so, but I honestly haven't minded at all. Any chance to check on our little guy is a blessing in my book. Overall, Parker and I feel very at peace about having a c section. Even if I go into labor on my own, we don't really foresee a scenario where I don't have a c section since our son's head and abdomen are measuring so large. We've weighed the pros and cons and prayed about it, and a c section just seems like the safer way to go to keep him from getting stuck. I know a c section is a lot of people's worst nightmare, but that was never me. From day 1, I didn't care how he got here as long as he gets here safely. There are risks either way, but we are praying for a safe and healthy c section for both our son and me. Looking back, I can honestly say I loved being pregnant. The first trimester was easily the hardest with the sickness and not having Parker here. The second trimester was the "pregnancy sweet spot" where I wasn't giant, food tasted good, and energy was up. I loved the second trimester! The third trimester has been tough, but I laugh and say God makes the first trimester so hard so you appreciate the second and third. I am ready to not be pregnant, but it's been a blessed journey. I still get indigestion after every meal, and I told Parker that I am really looking forward to laying down at night without feeling the need to throw up. 1. Finding out our baby is healthy. 2. Finding out we are having a boy. 3. Parker arriving home safely from deployment at the 30 week mark of pregnancy. It may be a few days before I am back on the blog, so feel free to follow me on Instagram (@chelseaphelps11) to see our son's birth announcement! Continuing to pray for you and this precious little one and the excitement that surrounds this week! Rejoicing with you and can't wait to "meet" him!! Sending lots of good thoughts your way for a smooth delivery! I agree about the second trimester, it really was the sweet spot of the whole experience for me. I'm glad you're at peace with whichever way the delivery goes. I think you're saving yourself a lot of extra stress. I can't wait to see that he's here! Sending you lots of prayers for a safe delivery! Congratulations, can't wait for the pictures to find out his name! The Women's wisdom is playing the most important role in getting pregnancy after woman’s marriage, if the woman does not have enough willing power to get pregnant she will not get the pregnancy easily in few days, and the woman’s who has strong inner power they will get pregnant soon after the starting of their marriage life.